Available exclusively at Rice Digital. 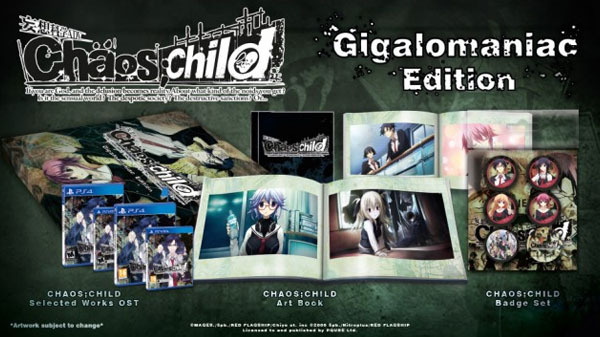 Rice Digital will sell an exclusive “Gigalomaniac Edition” of Chaos;Child, the online retailer announced. In Chaos;Child, a series of bizarre murder cases occur place in Shibuya, Tokyo. A young man named Takuru Miyashiro notices that the dates of the crimes match up with a series of murders that happened shortly before the fateful earthquake that killed his parents and changed his life six years earlier. Using this information, he deduces the date of the next murder and begins to investigate. Chaos;Child is due out for PlayStation 4 and PS Vita in North America and Europe in 2017.